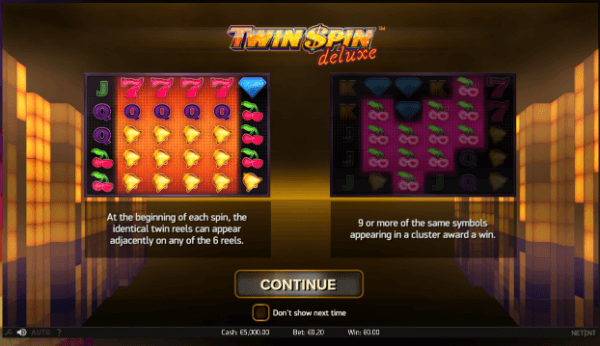 Five years after the launch of the original Twin Spin slot, NetEnt has come up with Twin Spin Deluxe in 2018. A modern take on a classic slot machine comes in vibrant colours and with improved bonus features that will keep you spinning the reels for the top prize. The difference between two titles is obvious with the original game featuring a standard 5×3 layout while Twin Spin Deluxe is played at 6 reels and 5 rows. Instead of landing symbols on adjacent reels, players will win payouts for creating clusters of 9 or more matching symbols anywhere on the grid with the Twin Reel feature activated on each spin. Get ready for a colourful gaming experience with this NetEnt slot machine which sounds as good as it looks! Twin Spin Deluxe features a unique layout. Using the Cluster Pays mechanics, (seen in Aloha and Emoji Planet slots), the slot will let you spin the reels without paying attention to the way symbols land as long as there are at least 9 matching symbols on the adjacent positions. The Twin Reel feature will help you collect symbols of a kind and hit a win. Modern-looking and entertaining. 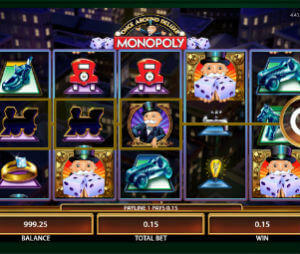 All fans of old-school slot machines will love the appearance of the game with symbols designed in vibrant colours. In addition, an engaging music score adds to the overall atmosphere of the game. An RTP of 96.61% and medium volatility will keep your bankroll balanced. Fully optimised for mobile play with all its features available. No – Why not to Play? No free spins. We love free spins and we bet you like them too, so it’s a shame there is no free spins feature in this cool NetEnt slot. No Wild. Yep, there is no substitute that will help you win more. This won’t take much time, since there is only one bonus feature available. On each spin between 2 and 6 reels can be affected by the Twin Reel feature. This could end in huge wins if you are lucky enough to get matching symbols on identical reels. Otherwise, this feature is completely useless. Twin Spin Deluxe is undoubtedly more advanced than its predecessor in terms of visuals, sounds and the overall feel, yet it misses some of the features we love to see in slot machines. If you like fruit machines with a twist, you should give this NetEnt release a try. Looking for a slot machine with more bonus features? Check out Aloha! Cluster Pays, When Pigs Fly or Aliens slots. If you like to keep it retro with a modern touch, give Hot Sync or Ultra Hot a spin or two.